STAR TRACE Overband Magnetic Separator has been developed to handle high volume product stream flows that exceed the limitations of standard permanent suspended magnets. Overband Magnetic Separator models are available in both, manual on/off or automatic, self cleaning system designs. Electrical Power Supplies to operate the magnets are also available and recommended to ensure proper electrical power is supplied to the Overband Magnetic Separator. 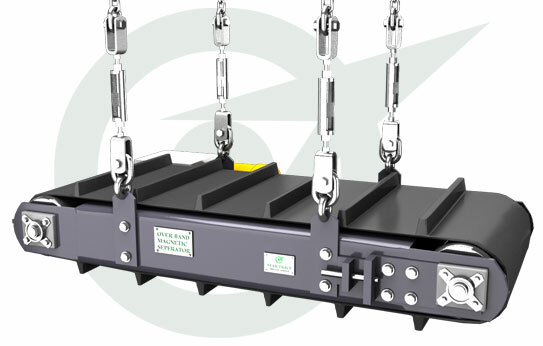 The Magnet in the Overband Magnetic Separator is made of High Intensity Strontium Ferrite Magnet and is guaranteed for the Magnetic Power throughout the life of installation. A Non - Magnetic Stainless steel Plate is provided to cover the poles of Magnet. There is no need for any electrical supply or maintenance. Operates in hazardous environments & Available in widths from 16" to 90"
The only aesthetic equipment to be seen in a manufacturing unit is the Overband magnetic separator. It hangs from above and sarcastically draws all ferrous substances hiding in the conveyor belt running below it. Star Trace as a leading manufacturer designs these Overband magnetic separators with robust body to with stand the rough conditions in which it works. The strong permanent magnet is well protected from pollution and working environment changes thus facilitating uninterrupted work flow. Industries which take the help of overband magnetic separators for increasing output and to protect their machinery, On installing the overband magnetic separators either over a conveyor or in combination with a magnetic pulley the out put is sure to increase remarkably and our range of product includes magnetic Pulley, Magnetic Plate, Electro magnetic separators, Overband magnetic separators, Magnetic conveyor and all types of magnetic separators used to remove ferrous contamination. Star Trace Pvt. Ltd. is a prominent manufacturer, supplier and exporter of overband electromagnetic separators (OBMS) which is used in various industries. We export a wide galore of magnetic equipments such as Magnetic Chip Conveyor, Rare Earth magnetic separators, Suspension Electro magnetic separators, Drawer magnetic separators, Liquid Line magnetic separators, Metal Detectors, Induced Roll magnetic separators, Suspension Fork Lift Magnets, Magnetic Pulleys, Alnico Magnets, Barrel magnetic separators, and so on. Overband Magnetic Separators (OBMS) has been developed to handle high volume product stream flows that exceed the limitations of standard permanent suspended magnets.OBMS (Overband Magnetic Separator) are available in both, manual on/off or automatic, self cleaning system designs.